Today at this diva home we are drying apples and strawberries!! A little tip from my sister Steph... Sprinkle a little cinnamon on the apples to make them extra tasty! Right now my house smells like heaven! Yum! 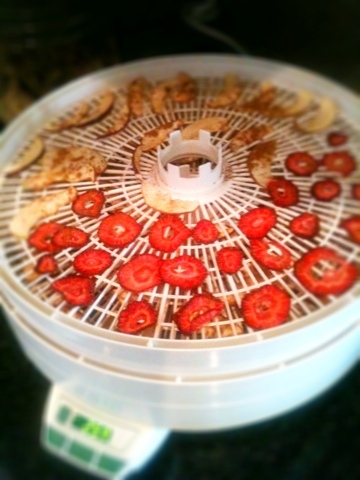 Owning a food dehydrator has been a game changer for us. Hope you are all enjoying your long Memorial Day weekend! Take care! Hi - can you tell me what this drying gadget you have is called. I'm in the UK so not sure what these are but would love to try and source something similar here! Thanks! Hi Angie - we got our dehydrator from Amazon via thehealthybee.co.uk - it's awesome for fruit and also great for tomatoes (grind them up into a powder & add to sauces for extra flavour). We also bought a "sprouter" for added nutrition in salads, sandwiches etc! !